For your next romantic milestone, spoil yourself and your hubby! Throughout the Philippines, there are many extravagant destinations and activities to celebrate your anniversary. From relaxing to thrilling, we’ve come up with a list of ten experiences to help you plan your next indulgent getaway. This five-star resort is set on the side of the island that faces that famous Boracay sunset. And though it is located right on the beach, one of its most unique features is its 3,300 square meter, pool. Connected to its various eateries and bars, the pool allows guests to swim from one dining destination to the other! For total privacy, you can rent the presidential beach villa, which features a balcony with a sea view, a private pool and jacuzzi. Feeling adventurous? You can book Manila Luxury Club’s two-day, one-night private sailing tour around Pico de Loro. This yacht getaway departs from Manila, and offers you a personalized menu, a personal crew, and a whole lot of privacy. And if you want to share the experience with friends or family, the elegant Hans 455 sailboat has a capacity of six guests. For a fairytale experience, book a week at the unique Fundacion Pacita in Basco, Batanes. Straight out of a storybook, this stone cottage is set atop a verdant hill overlooking the sea. It used to be the home of Pacita Abad, an internationally-acclaimed local artist. And so, it’s covered in vibrant artwork, giving it a familiar bed and breakfast coziness, while also transporting guests to a foreign world. The Philippines doesn’t have a Michelin-starred restaurant yet, but it does have a Michelin-starred chef! Jason Atherton, the chef of Cebu’s The Pig & Palm decided to set up shop in his wife’s hometown. The result is modern Spanish tapas and Filipino-British cocktails, in sleek interiors. Even for those outside the Cebu area, this restaurant is worth making a trip for! Known for its holistic healing treatments, creative healthy menu, and sophisticated amenities, The Farm at San Benito is the perfect place to relax and recharge with your partner. Especially if you’re both overwhelmed at work, we suggest signing up for their signature de-stressing programs. But if you’re just looking for a luxurious getaway, book any of their villas. The Master Villa has a private pool, covered terrace, fully equipped kitchen, and canopied king-sized bed. 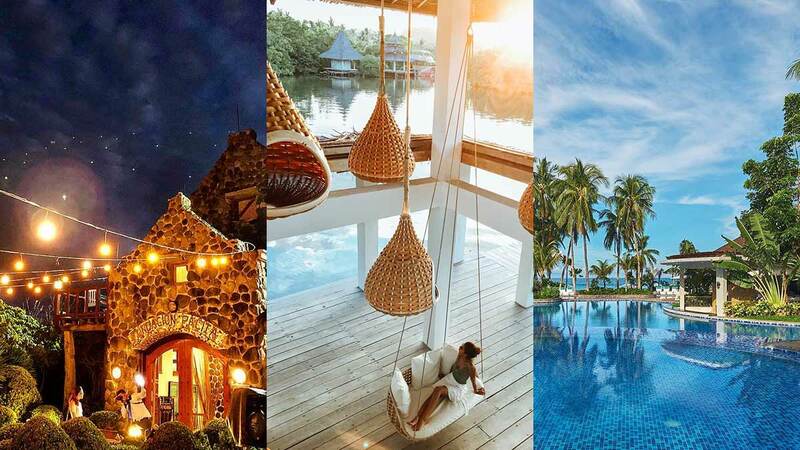 Located in Siargao, Dedon Island Resort (which is relaunching itself as Nay Palad Resort later this summer) offers guests access to “barefoot luxury.” This includes: indulging in spa treatments, enjoying the surf, and relaxing in the many available swinging lounge chairs. It’s the perfect getaway for eco-conscious couples. All the food is organic, and the resort is committed to being culturally and environmentally sustainable. For a gastronomical getaway right in Manila, try the out-of-this-world dining experience at China Blue by Jereme Leung, which is located at the Conrad Hotel. The floor-to-ceiling windows overlooking the bay, the extravagant chandeliers, and the private rooms aren’t the only attractions. The modern Chinese food is the real star. Be sure to leave room for the hand-painted Black Gold Egg Custard Buns at the end of your meal! Spend a half a day taking in the stunning rice terraces by private helicopter. This bird’s eye tour of the Philippines’ most popular UNESCO World Heritage Sites departs from a private helipad at NAIA airport. The round trip takes about five hours. It’s the perfect romantic day trip from Manila, without the threat of a traffic jam to ruin the mood. To feel like you’re in the Maldives, without ever leaving the Philippines, head over to Huma Island. When you rent out any of the bamboo villas that surround this tiny island off the coast of Busuanga, Palawan, you get to be in your own private paradise. The villa’s sundeck facing the sapphire sea boasts an outdoor tub and lounging area. Plus, the resort itself offers snorkeling, spa treatments, and all-inclusive food and transportation for a worry-free anniversary! For an extravagant staycation, book a night at Raffles Makati. The luxury hotel offers stylish rooms with mesmerizing city views, a host of romantic dining areas, and discreet butler service. Here, you and your other half don’t have to focus on anything other than each other.